Darkness ebbed to an overcast calm. Wool-lined winter moccasins stepped and paused eastward—the object of that crisp November morning’s still-hunt was the nasty thicket in hopes of bringing fresh venison to the pot. Thanksgiving of 1795 was a week off. An overwhelming urge to sit, to stay put, washed over my being, forty or so paces from the cedar-brush shelter. The premonition made little sense. The campsite was in plain sight. Only a doe-ear’s worth of the red, four-point trade blanket, rolled and carefully tucked behind the oak tree that supported the lean-to’s angled ridgepole, remained in view. 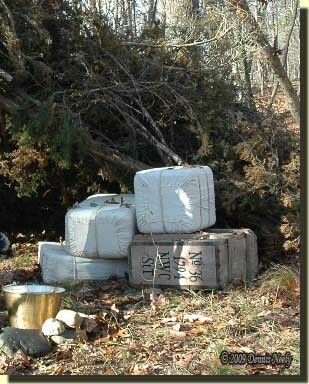 Canvas-covered bales and the last crate of trade goods sat to the right of the fire pit. Obedient to the inner voice, I sat cross-legged, facing northeast, with my back to a hefty red oak trunk. Sounding closer than they were, the two muzzle blasts echoed out over the River Raisin. A healthy concern marched to the fore. “Two to one” I thought as I peered around the oak and surveyed the forest to the west. I saw nothing, but did not expect to, at least not right then. My left hand brushed away more damp oak leaves, and in a moment, my hips scooched into the new nest from which I could observe the hill crest that created the little valley sequestering the station camp. Beyond, the hill fell away into the river’s bottomlands, forming a long, natural boundary between the treacherous swamps that bordered the Raisin’s course and the higher ground of the hardwoods. If the hunters took a deer, they would return to the river and not venture east. But there was always the chance that they missed or might follow a wounded whitetail. Perhaps they were British rangers from Fort Detroit? The prudent choice was to sit and wait and see. In a matter of minutes, the cautious ears of a yearling doe bobbed along, south to north, just over the ridge and in line with the leaning white oak. When the deer reached the sassafras, she turned east, crossed over the ridge and dropped into the valley. She paid little mind to the campsite and eventually meandered in the direction of the huckleberry swamp. I kept a keen eye on the ridge crest, and in due time an older doe and two yearlings came wandering over the hill, not far from where I spied the first doe. The three chose a different trail, passing behind the shelter, then upwind of my lair, maybe twenty paces distant. I sat motionless and watched their progress through squinted eyes. I did not shoot, yet these three occupied my attention. The trio walked over the hill, in the direction of the isthmus that separates the nasty thicket. I grew concerned, because watching the deer consumed more minutes than expected; I had not surveyed the western ridge in some time. I turned back slow. My gaze lingered on a tree top that was down to the north. Again, the inner voice urged caution. 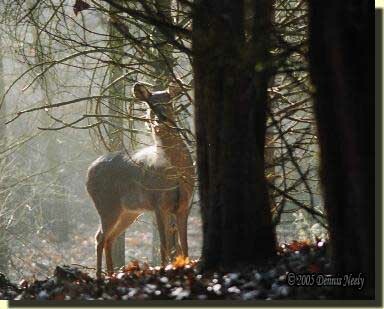 “In the shadows, by the cedar that angles to the left…Do you see the deer?” I whispered. “Trees don’t grow bigger,” I whispered without thinking. Last winter, at the Field & Stream Deer and Turkey Expo, a fellow traditional hunter stopped by the 1794 hunting camp display and wanted to talk deer hunting. He said he grew up pheasant hunting and also liked to pursue squirrels and rabbits, but nothing serious. He dabbled with modern deer hunting, but never became too obsessed with that, either. Then a few years ago the re-enacting bug bit him. He settled on the French & Indian War era; his persona was that of a colonial militiaman. At an historical encampment, the campfire talk turned to deer hunting in a period-correct manner. The thought intrigued him, so last fall he decided to take his alter ego deer hunting. He said he saw very few deer and thought his 18th-century clothing was to blame; at least his modern counterparts insisted that was the case. His hunting companions said they spotted plenty of whitetails on the same ground—maybe they did and maybe they didn’t. But after asking a few questions, I discovered he was looking for a whole deer, not individual body parts. I reassured him this is a common mistake. As a veteran traditional woodsman, I have to constantly remind myself that others might not possess the same level of hunting experience that I do. I was guilty of overlooking that admonition when I quipped “Trees don’t grow bigger” without thinking. Everyone in this pastime is at a different location on the path to yesteryear—some have more woodland experience and some have less. Being living historians, we sometimes focus too intently on only one of the three elements that are key to any traditional black powder hunt—the historical side. We fuss about the period-correctness of wool versus buckskin for leggins, knee breeches or breechclout, and whether a hunting shirt is “…open before…” or not. And depending on the individual, sometimes the emphasis centers on the black powder arm, often times a new one, at least new to the persona. Regardless, developing the hunting skills of old comes in a dismal third and that circumstance should not be. The truth of the matter is we all are attempting to emulate bygone souls who possessed an uncanny ability to survive based on a keen understanding of the forest and its creatures. Although the three elements fluctuate in importance throughout the hunt, the traditional side, the chosen black powder arm and the development of one’s hunting abilities must maintain some semblance of balance. To point this out I often ask, “When was the last time a thirty-point buck stepped out into a clearing, stopped at twenty paces, turned broadside and looked away while you cocked your firelock, tried to calm pounding arteries and keep the front sight on hair?” That question always brings a chuckle, and it’s a cinch no one has to take off their moccasin to keep count. But in the glade, white-tailed deer or wild turkeys or fox squirrels do not grow to old age exhibiting that type of behavior. They use the cover at hand, because they are, after all, tenants of the forest. At best, only a portion of a critter’s body is visible. Many times a woodsman glimpses eyes and ears. Depending on the situation, sometimes the quarry is not discovered until it is closer, like the deer that slipped behind the downed tree top. A patch of hair, a twitch of a tail or the movement of a hind leg provides the only inkling. 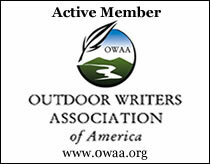 This entry was posted in Deer Hunts, Skills and tagged Dennis Neely, historical trekking, Mountain Man, Native captive, North West trade gun, Northwest trade gun, trade gun, traditional black powder, traditional black powder hunting, traditional blackpowder, traditional blackpowder hunting, Traditional Woodsman. Bookmark the permalink.